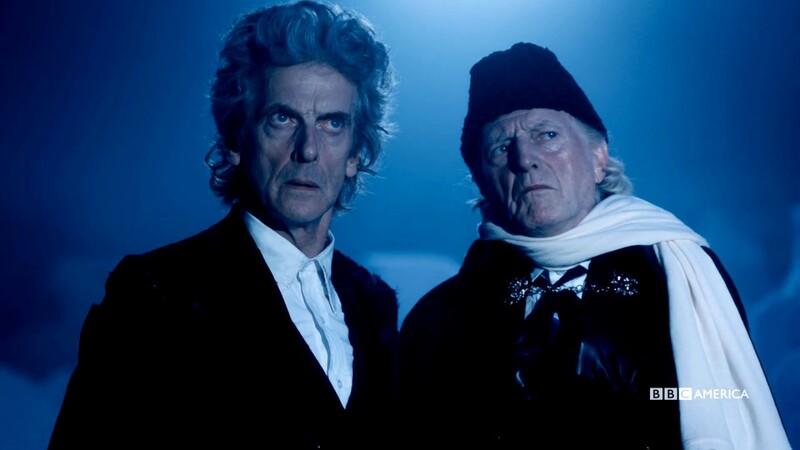 “Twice Upon A Time” also features Mark Gatiss as the Captain, and the return of Pearl Mackie as Bill Potts, who was last seen converted into a Cyberman in the tragic series 10 finale, “The Doctor Falls.” And, of course, Whitaker will cameo at the very end of the story. The Doctor Who Christmas Special, “Twice Upon a Time,” premieres Christmas Day at 9 p.m. on BBC America. This entry was posted in Cult TV, Science Fiction, Video clip and tagged 12th Doctor, 2017 Doctor Who Christmas Special, David Bradley, Doctor Who, First Doctor, Peter Capaldi. Bookmark the permalink.